Ron, an experienced entrepreneur and Greg, a seasoned bank president, who both have scars from their experiences, often approach this timely topic from different perspectives. A concise, insightful (and sometimes humorous) guide to understanding the world of banking-and how you can navigate all the tricky waters. You'll learn dozens of do's and don'ts to build the right relationship with your banker from an entrepreneur who has decades of experience getting to YES. You'll also get the perspective from the other side of the desk from a bank president who has reviewed the business plans and loan applications of hundreds of entrepreneurs. A Loan, Again? Naturally ! 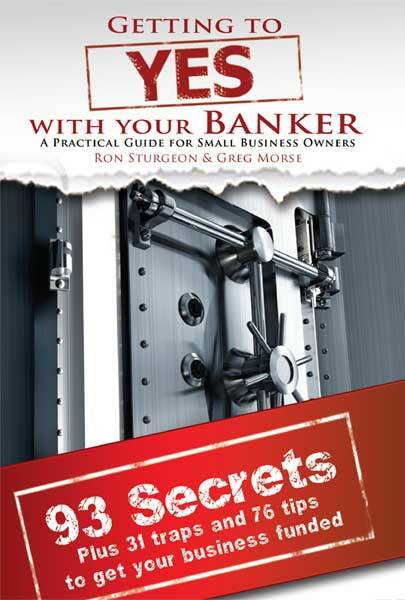 I read your new book over the past week- ‘Getting your Banker to Yes’. I honestly thought I knew everything there was to know about dealing with a banker since this is something I do all of the time, I mean literally every day of my business life for over 20 years. You guys did a really nice job with the book – well laid out, very easy to follow. I got a lot of useful information out of the book. I am going to get a copy for my controller and have him read it too. CFO Waste Partners of Texas, Inc.